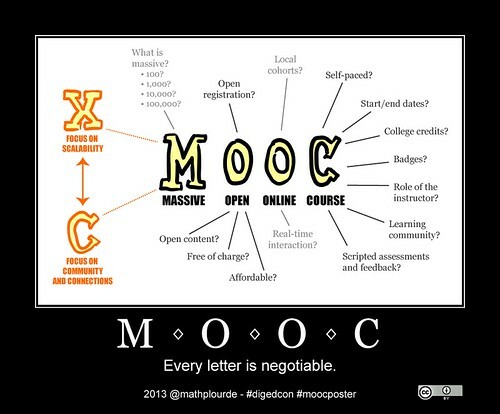 My poster/meme is targeted at exposing the mixed bag of what people mean by the term Massive Open Online Course, or MOOC. As with many trending topics, many people and institutions have jumped on the MOOC bandwagon, but have little shared understanding of what they actually are, or what they are useful for. By adding prompts around the potential meaning of each letter, I wanted to represent visually the fuzziness of the concept, and the need to develop a better taxonomy of what it means to learn online. Although I have represented this concept visually myself, I would not have come up with the idea without attending Educon in Philadelphia in January 2013. I borrowed the tagline from Jon Becker, Assistant Professor at VCU. Feel free to use, reuse, comment! It’s always a work in progress!